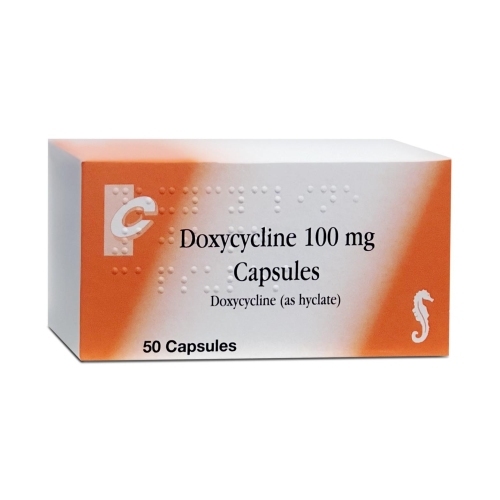 Doxycycline is an antibiotic belonging to the tetracycline class, that is used to treat a variety of different conditions including chlamydia. It is also used as a treatment for acne, chest infections, and also used in the prevention of malaria. Doxycycline interferes with the bacteria’s ability to produce proteins, which are important for its survival. These proteins are essential for bacteria to multiply and grow, and doxycycline is able to prevent the bacteria from producing these proteins, resulting in the bacteria dying. How should I take doxycycline to treat chlamydia? Doxycycline capsules should be taken twice a day for 7 days. You should take the capsule with a full glass of water, whilst sitting down or standing (you should not take doxycycline close to bedtime to avoid the possibility of throat irritation). You should avoid taking any indigestion remedies for two hours before or after taking doxycycline, as they can reduce the effectiveness of doxycycline. You should also stop using any supplements that contain iron, calcium, zinc, magnesium or aluminium, as they can also negatively impact the effectiveness of doxycycline. It is important to remember to take your medication regularly and to complete the course to ensure it works properly. Failure to finish the prescribed course of treatment may mean that the bacteria has not been fully killed, and may multiply to form bacteria that has become resistant to doxycycline. Do I need to take doxycycline with or after food? Food does not affect the absorption of doxycycline and you can choose to take doxycycline on an empty stomach or after food. One of the possible side-effects of taking doxycycline is that it may make you feel slightly nauseas. If this is the case, you may find it helpful to take doxycycline after a meal. Can I drink alcohol if I am taking doxycycline? Moderate alcohol consumption will not necessarily have an impact on the effectiveness of doxycycline, but it can make you feel slightly sick and dehydrated. You should avoid drinking large amounts of alcohol or avoid alcohol consumption altogether for the duration of your treatment if possible. Large amounts of alcohol consumption can reduce the effectiveness of doxycycline in treating chlamydia. If you forget to take a dose, you should take it as soon as you remember. If you remember when it comes to taking your next dose, do not take two together. It is unlikely that missing one dose will have an effect on your treatment, but you should inform your doctor or pharmacist, and you may need to test for chlamydia a few weeks after having completed treatment, to make sure that it has been cleared. Missing more than one dose may have an impact on the outcome of treatment, and if you think that you might forget to take your medication, you should order azithromycin. How long does it take for doxycycline to treat chlamydia? It can take up to 7 days after having completed treatment, for your body to be free from chlamydia. This is why is it important to avoid any form of sexual contact for 7 days after you have finished treatment. What should I do if I vomit? If you vomit after taking doxycycline, you should carry on with the prescribed course. Partial absorption or missing one dose is unlikely to have an effect on the success of treatment. Try taking doxycycline after a meal to reduce feelings of nausea. If you throw up more than once, you should contact your doctor as you may need to try a different treatment. How effective is doxycycline in treating chlamydia? According to research, doxycycline has a 100% success rate in treating chlamydia. It is important to note that treatment must be taken as prescribed, and failure to adhere to the prescribed regime of one capsule twice a day may have an effect on results. Who is doxycycline not suitable for? You have any of the following conditions: Myasthenia gravis, porphyria, Systemic Lupus Erythematosus or you have any stomach problems that cause diarrhoea. Is it safe to take whilst pregnant or breastfeeding? Taking doxycycline when pregnant can slow down bone growth and stain the teeth of the developing foetus. Doxycycline is also present in breastmilk and should be avoided in both scenarios. Is doxycycline safe to use with other medication? You are experiencing any unusual side-effects such as difficulty breathing, fever, swollen glands. Should I get retested after taking doxycycline? Doxycycline has a very high success rate and it is not usually necessary to get tested once treatment has been completed. However, you should get retested if you didn’t take your medication as prescribed, you engaged in sexual activity whilst still taking treatment or in the seven days after stopping treatment, your symptoms still persist or you have sexual partners that change on a regular basis (testing is recommended every three months in this case). Is there another treatment option? For those that are allergic to doxycycline, or unable to take it, azithromycin is a suitable alternative. Clinical studies have proven it to have a success rate of 97%, with a mild side-effect profile. Why should I inform my sexual partners? Chlamydia is the most common STD and can cause many long-term complications such as infertility and reactive arthritis. You should let your sexual partners know if you have had a positive diagnosis, so that they can receive treatment and avoid re-infecting you or others. You should let your GP know if you are scheduled to receive a typhoid vaccination whilst on treatment, or within 72 hours after having completed treatment. This is because doxycycline can reduce the effectiveness of typhoid vaccinations. Can I fill out a questionnaire for my partner? Each patient must fill out a questionnaire individually as it assesses the suitability of doxycycline based on their medical status. The online consultation is intended to ensure that our service is safe for all those that we prescribe treatment for. Your medical records are stored on a secure server, with your order being dispatched in an envelope that has no reference to what is inside. You can order doxycycline online to treat chlamydia if you or your partner have had a positive diagnosis for chlamydia. You will need to fill out an online consultation for our clinical staff to asses, before your order is dispatched from our pharmacy. If you haven’t had a chlamydia screening, you can buy a home chlamydia test kit, which involves providing a urine sample so that it can be analysed in our partner laboratory. Results usually take 1-2 working days to come back after having sent off your sample using the pre-paid envelope provided.